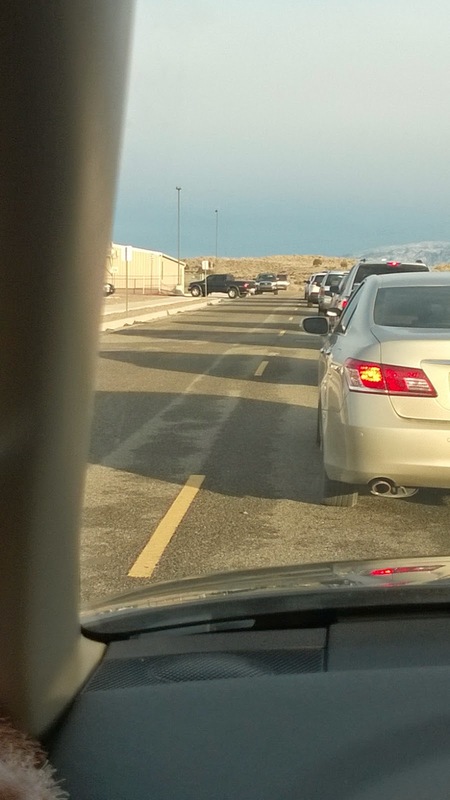 I never thought I would be excited to wait in line to drop off and pick my son up from school. Yes, the carpool line….I am thrilled to be in the carpool line! A year ago my son was in the hospital and has been wheelchair bound until recently. My "Christian" has been fighting like I've never seen a little boy fight to walk without needing his wheelchair. Despite the damage to his knee and the hitch in his gait, nothing is holding him back from keeping up with his friends. My son can walk into his school on his own two feet. He is walking up and down the halls of his school. He is eye level with his friends. I don't need anything for Christmas this year…..I've already received the greatest gift ever…to be a mom in the carpool line once again. Today is huge! As of this moment, my "Christian" has severe hemophilia! Why the excitement? 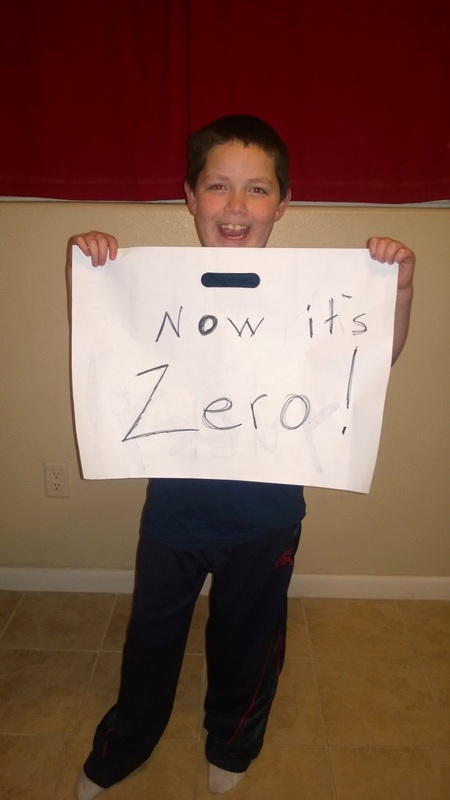 His inhibitor (the bug that eats up the clotting factor he needs) is registering ZERO! For the moment, it is gone. No inhibitor! 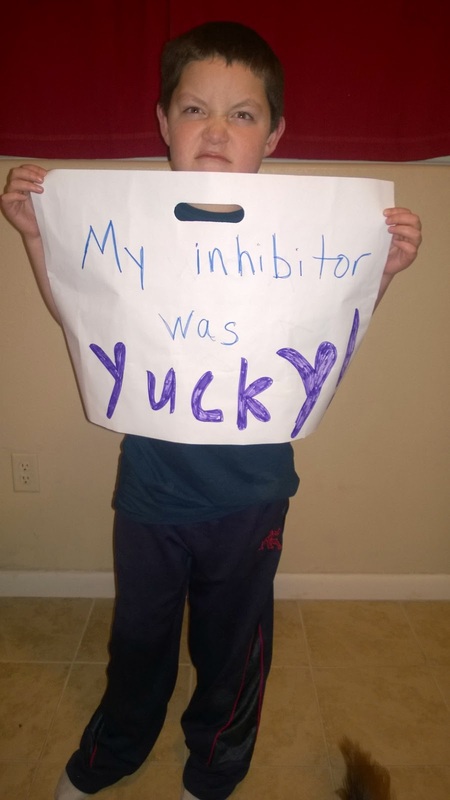 This inhibitor battle began when "Christian" was 11 months old and he turns 9 in January. In the inhibitor community we know that it is not always best to concentrate on the numbers and levels associated with the inhibitor. But you know, even if it's only for a short season at zero, we are going to celebrate and not let the fear of the inhibitor returning steal our joy. I know that living in fear is debilitating. There are people in our community that have only known inhibitors for years upon years and they don't know if they will ever be inhibitor free. My heart breaks for every person that has been on this path despite the length of time. It is not easy. But having hope for zero and having hope that treatment will continue to improve is sometimes all we have. It has been a long time since I have been comfortable accessing my son's port. For the past two years he has been dealing with PTSD and a port that just didn't work well. He would put up a physical fight and be in hysterics with the whole process. Now, my son is in a different place and accessing has become routine. When you have been accustomed to having a certain amount of control with accessing a port or a vein and infusing when needed if you lose that ability and it is devastating. You feel lost. I am not a control freak but I do like to know that I can handle things. And when my son is having a bleed and I have to depend on someone else to access his veins, it is stressful and scary. His new port is working great! He is cooperating and has a sense of control. I knew this time would come and there are moments I think back to even just a couple of months ago and realize that our world was completely different! Things can sure change quickly. For months and months we struggled with his treatment and now that we are on the other side and able to breathe a little easier it's almost like a dream…a really bad dream. You just have to hang on. Port #6 has arrived and is 10 days old! Friday my husband accessed it for the first time and he said it was impossible to miss. What a relief! We have had so many problems with "Christian's" port and the fact that he struggles with a horrible fear of needles does not make infusing easy. Having a new, higher profiled port was the only answer and I am so relieved that it is healing beautifully. I am looking forward to accessing the port within the next few days. It has been at least two years since I have been comfortable accessing my son. It has been hit and miss but having lost a great amount of "control" over my son's care has been difficult. It amazes me that ten days ago my son had surgery. He spent the weekend playing in his new "Ninja" costume and tonight enjoyed a leisurely bath without his port accessed…completely free of a needle :) I don't think I would bounce back as quickly…most adults don't. Surgery is serious stuff. It's never "routine". When you send someone you love off to surgery and they are loopy from the medicine or already sleeping, the seriousness sometimes does not set it quickly. Last week my son cried as he was wheeled away from me and his Dad. That's never happened and it left me doubting the choices we had made. Often times those of us affected by chronic illness seem to shrug off the seriousness of a situation. Maybe it's a defensive mechanism…or just plain fear. It's almost as if we become "numb" but not because we don't care, it's because we care so much that it physically hurts. We move forward trying to make the best decisions we can with what we have…that is all we can do. Don't doubt yourself. Most Sunday mornings you will find me in church…but not today. My husband and I were not able to access "Christian's" port on Saturday evening and when we spoke to the doctor on call, we decided to skip his dose of FEIBA. He was not bleeding and not in a critical situation so I planned on taking him to the emergency room the next morning to get an IV started. 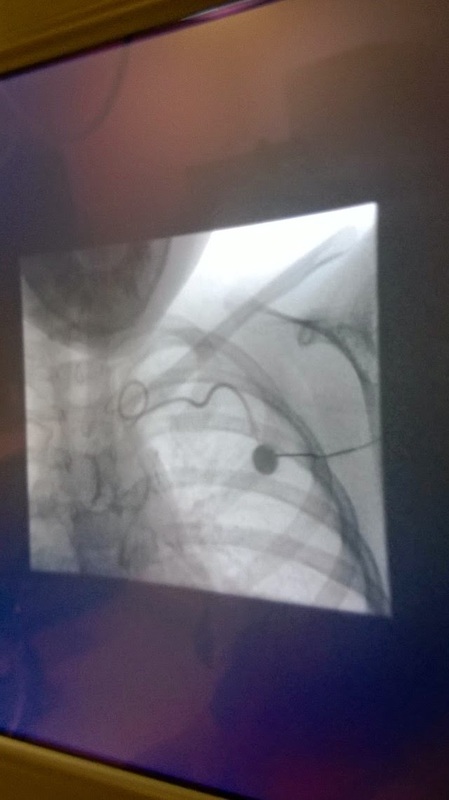 His port was aggravated and with his history of difficult access with #5, we thought it best to give it a break. Two attempts were unsuccessful and the third attempt was made by the "Ultrasound Squad". You know, the ones who come in with the ultrasound machine to find the veins that are deep. They use the ultrasound machines for people with difficult veins, elderly folks whose veins are very fragile and kids like Christian who are just hard sticks. Fortunately they were successful and my son has an IV for the next few days until we can meet with the surgeon to figure out what can be done to get #5 in the right place. I am hoping it is a matter of going in to suture the port more securely….or something like that. When my Christian is in the hospital setting and a needle comes his way, his PTSD is raging. He can get to the point of being still but his fear sends him out of his mind and he screams and cries unlike anything I've ever heard. Sometimes I am in the room, other times I am right outside the door and most times you won't see a tear on my face. I walk away from these times wondering how in the world I can be devoid of feeling? Truth is, my feelings are there. I am devastated, sad, angry…every emotion in existence is flowing through my being but my son needs his factor and the only way to administer it is through a vein. If you are watching a parent endure something awful with their child and you don't "see" what you expect, keep in mind that you never know what is going on inside. That parent may not be shedding a tear because they are screaming prayers in their heart and mind to the One they believe can bring peace. Perhaps that parent has been up for hours on end and is so exhausted that they can hardly stand up. Maybe that parent is worried about their other children or loved ones at home while they are on "hospital duty" and are on their last day of paid leave from work…or are looking forward to getting back to work to "rest". What they have been through is probably more than you will ever experience in your lifetime. On this Sunday evening I am sending out my good thoughts, energies, and prayers to those families in the hospital with their children. They sit and watch as they are not able to take away the pain and do what they can…love. When you can touch something it's real and reassuring. Not everything is tangible, but it is nice when it is. Children who are in and out of the hospital with chronic illnesses only know their illness as a way of life. What most of us know to be true is that illness is not "normal". I struggle with explaining to my "Christian" why he has hemophilia when he tells me he hates hemophilia. There is not a good answer. God didn't "give" him hemophilia, it wasn't bad luck, he wasn't a bad boy…..it just is. And I continue to tell my beautiful son that he just wouldn't be "Christian" if he didn't have hemophilia and that I love him exactly the way he is. I would love for him to not have the bleeding disorder, but it is my responsibility to help him have an empowered life, hemophilia or not. A few years ago at our hospital (University of New Mexico Children's) they began to participate in the Beads of Courage program. 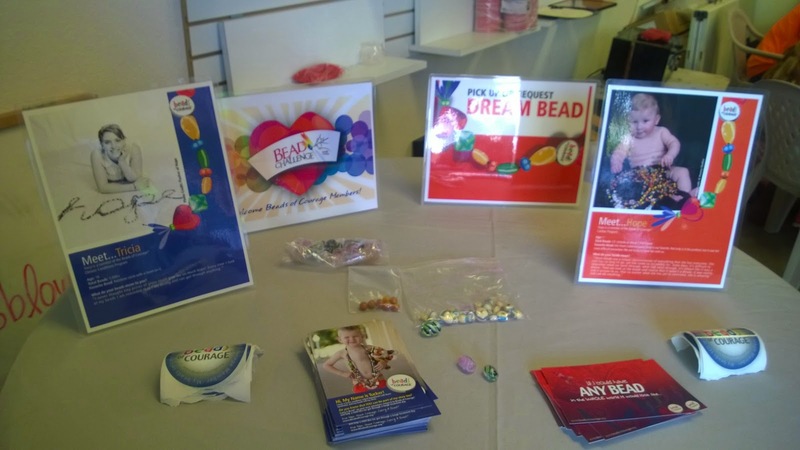 It is a program that is found in many hospitals across the country that gives children beads for every procedure, milestone and event in their medical history. It provides a tangible piece to their journey. 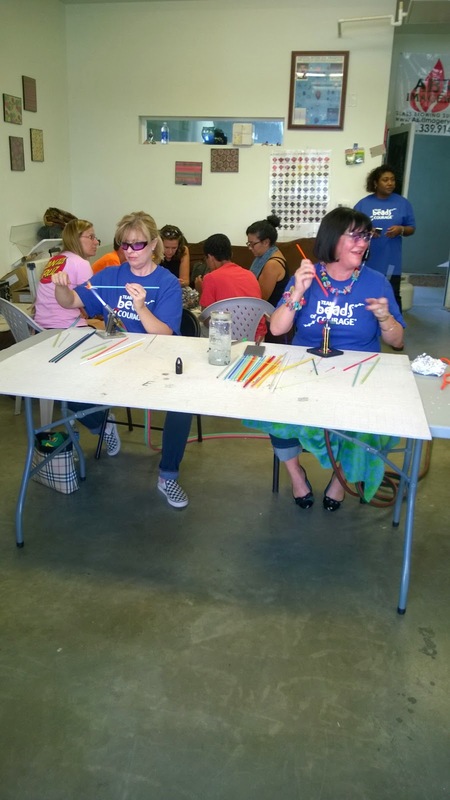 The Beads of Courage program hosted a nationwide event on Saturday, September 20th and my son was looking forward to watching the glassblowers make the beads that he treasures. 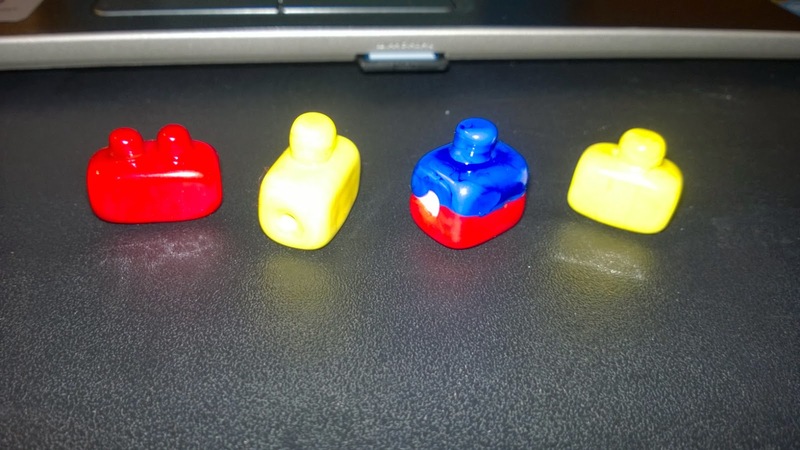 He was even able to request his "dream bead"….a Lego bead. Since he was in the hospital during the event, I stopped by to pick up his bead. It was specially wrapped with his name and the name of the designer…Nan Charif of Tucson, Arizona. 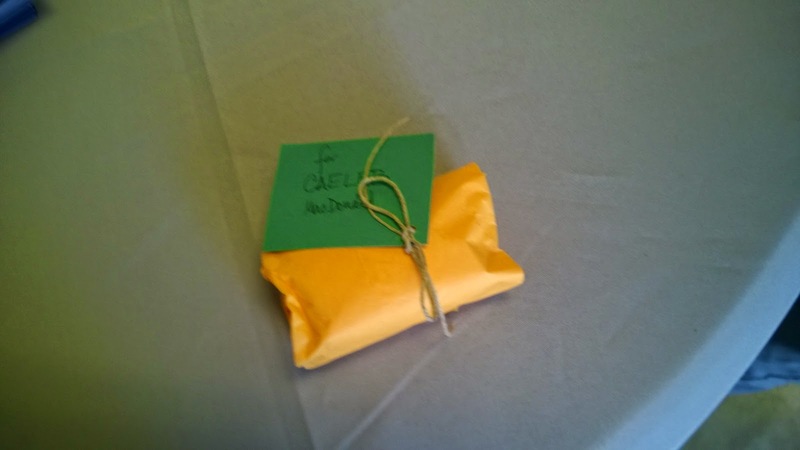 Oh my goodness….for my son, who had an extremely rough week in the hospital to open a special package with his dream bead was just priceless! This completely warmed my heart today. Maybe the beads are more for me than my son. I know that what my son deals with is more than most people will ever endure in a lifetime, and he is only eight years old. Part of me hopes that he doesn't remember everything in as vivid of detail as I do. But I want him to know that what he has endured has been beyond limits. That he has a strength in him that many people only dream to have. My sweet "Christian" was admitted to the hospital Sunday night because his Dad and I just could not access his port. The next couple of days were filled with IV's and a port that had a nasty rash on the outside. Last night the IV infiltrated the muscle in is upper arm. It was pretty awful. It was painful, swollen and needed pretty constant monitoring throughout the night. It is healing well, but still a source of pain. We had no other choice than to access his port. My husband I tried, the nurses tried…we had two people in the room then seven people and the strides we had made to helping his conquer his PTSD seem to have vanished within one difficult day. Fortunately the surgeon who placed the last four ports came in and was finally able to access. The scariest part about this is not the screaming and tears and physical fighting that he does. It's when we have no access into a vein and cannot get factor into his system, that we become a little panicked. In an instant you can lose venous access and struggle to find a new site. Just as we thought we may get to go home today my boy develops a fever. Blood cultures have been drawn and now we wait. Hopefully it is just a virus that has nothing to do with the port, but when you have a port, you have to assume the worst first. I am so grateful for the "good run" of time without much incident. But one thing I know for definite sure is that it could always be worse. To battle my "Christian's" allergy to factor VIII, we are slowly increasing his dosage each month (in addition to 300 mgs. of Xolair every other week). He looks great, is having a fantastic start to the school year and is just as happy as any little boy could be. When I ask him what he like the most about 3rd grade he simply says, "Everything." That does a mama's heart good. I am so grateful that things are going well. The truth is, things can always be worse. That goes for all of us….bleeding disorder or not! I am not going to live in fear of the next bleed. I am not going to "What If?" myself into being sick. I am choosing to take the good times and enjoy them and be right alongside my family (and not feel guilty about it). I hope that you are experiencing a good season right now. And if you aren't….it will get better. In the world of inhibitors it is easy to get fixated on numbers. Inhibitor levels are measured in BethesdaUnits (titers) and it is just about everyone's wish to be below 10. This is the level where most doctors target to get in order to start Immune Tolerance Therapy. But titers go up and down as fast as the wind changes sometimes. We are always told to look at the big picture and not get too excited when numbers are low. 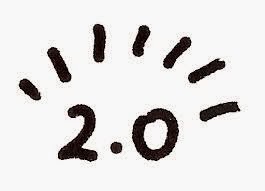 Our hope as parents is for the inhibitor to register as ZERO! Wouldn't it be fantastic to be at ZERO and only need factor VIII like a "regular person with hemophilia"? It sounds crazy but if you living with an inhibitor the dream to "only" have hemophilia is very real. My "Christian" was diagnosed with an inhibitor when he was 11 months of age and his titer registered over 2,200. I never knew the numbers went that high. And here we are in his eighth year still living with an inhibitor and as an added "bonus" an allergy to factor VIII. And today I am celebrating the number. The number that shows us where we are at in the battle, at least for today. "Are you kidding me?" I gasped as I heard the result over the phone. I think time stopped for a moment because I had not dreamed his level would ever get to this point. It just didn't seem possible. For the years of pain, joint bleeds, hospitalizations, anxiety, fear, missed school and vacations, PTSD and hating hemophilia, my Christian is having a good season. A season of "normal" for him that involves walkers, wheelchairs, adaptive sports camp, a bent knee, hopping on one leg and a fifth port. It's not normal for most but we'll take it for the moment. Hope is a good thing. I have plenty of it. Tonight we went to have dinner with friends. They grilled steaks and we had great conversation. My "Christian" was looking forward to playing with their children who are both close in age. Our friends were so thoughtful because they had already planned for their children to bring toys from upstairs to the floor level since they knew Christian is still not able to walk. But it takes more than a bent knee to stop my warrior. He went outside, played in the sandbox, loved on their big, cuddly dogs, made it up the stairs several times (scooting on his hiney) not missing a beat. When we left he was sweaty and flushed. Christian had an evening of "normal" kid stuff and no one even gave his bent knee a second thought. They just wanted to play and they played hard. I find that hemophilia takes so much away from my son and our entire family sometimes. 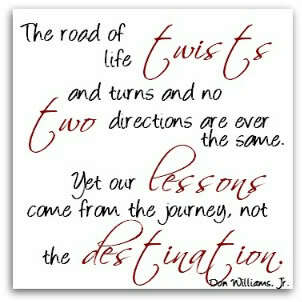 But despite the roadblocks that are put in our way because of this nasty disorder we all manage to move forward. How we get past the roadblocks may take some creative thinking, but we always manage. I love those moments when I see my son keeping up with others. He may be a little slower to get around, but his smile and his spirit are alive and well. Sometimes you just play the cards you have been dealt the best you can. You don't even know the difference. For me I don't know if I would know what to do if I had a child without a bleeding disorder! Both of my sons are extremely different but the fact is that they both need clotting factor to live as normal a life as possible. This past weekend I attended the NHF Inhibitor Summit. I always enjoy being in the same room as other families who also deal with medical issues that are similar to those of my youngest son. The truth is when you have hemophilia, you are one in several thousand in the United States and that is pretty rare. But this weekend a statistic hit me between the eyeballs. Those affected with an inhibitor, like my youngest son, are an even smaller group. About 1,000 in the country. And when the doctor leading a discussion was talking to us about immunology she even mentioned, as she looked straight at me, that there are even instances now occurring with inhibitor patients developing allergies to factor VIII…and she only knew of four cases in the country and we were one of those. I don't regret a thing. I would love to take away the bleeding disorder! I would love for my children to have never experienced the physical pain they have endured in their lives…but what I know is that my kids are rarities…unique personalities…exceptions to the rule. How can that be a bad thing? My big realization may have initially been the reminder that my children really do live with a very rare, serious medical condition, but the greatest realization today is that I have been blessed with a passion for my children. A passion to give them the best medical care possible, never taking no for an answer and making sure the next person to come along benefits from what we have experienced. "Christian" developed a clot that has essentially become part of his body. The surgeons tried to break it up and it just won't budge. Because of this issue the port had to be placed in a place we had not expected, his lower abdomen. The surgery lasted much longer than we anticipated (which was very nerve wracking) but all is well. He even seems to like the port in this new area. We'll know more this week as we access it for the first time on our own. These things don't get easier, but what I know for sure is that you have to be positive and pray for the best. And when you are on the other side of a stressful, scary situation that completely freaks you out...you start to breathe again. I had trouble accessing "Christian's" port last week (while his Dad was out of town). What started as needing help accessing turned into a dye study to check placement and we learned that the port had coiled and developed a clot. I am glad it worked out the way it did without the port completely shutting down but I sure didn't expect to hear this kind of news. Port #5 is scheduled to be placed on Monday, June 16th. My son will be admitted the day before and hopefully will not endure excessive bleeding. I know this needs to be done and am not "worried"….at least not yet. At one point we were unsure as to whether or not to place a new port (when the time came) or have a Broviac placed. My Christian suffers from PTSD and accessing is a challenge. The past couple of months have been a huge improvement as we have worked with him with a play therapist and simply found that we have to take plenty of extra time with him while accessing. 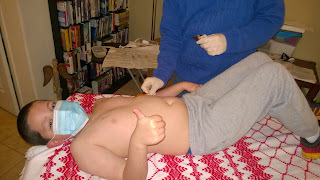 He needs some control during the process and gives us the "thumbs up" when he is ready for the needle to come into view. The funny thing is that I don't know if we have ever known ahead of time that we were going into the hospital for an admission. My family can truly be considered experts when it comes down to gathering items together at a moment's notice to get to the hospital, but knowing ahead of time and being able to plan and prepare is new. It's a different perspective. I have my list of questions for the surgeon as well as my suggestions for treatment regarding factor and ultimately I know that this is the best move for my son. Knowing it's the best move doesn't make it any easier. I don't know what life would have been like if my brother had lived. Would he have been annoyed with a little sister following him wherever he went? I like to think he could have whipped up a mean peanut butter sandwich and taken me out for ice cream on a hot afternoon. Maybe he would have had a passion for music like I do? I like to think he would have come to my band concerts and after a halftime show on a Friday night have patted me on the back and said, "Nice job!" And when my sons were born I imagine he would have been at the hospital making sure that I was okay and would have been one of the first to love on his new nephews .... and later given me a shoulder to cry on when they were diagnosed with hemophilia. I have a picture of him in my mind as a strong, healthy man who did everything he could to live with hemophilia even with treatment that was not the best. The few that knew him are not around anymore and his legacy could easily fade away, but today I can say that I proudly say “Ronaldo Julian Campos was born 52 years ago today...he was my brother." I don't think mos people would say that they like to be stuck with needles on a regular basis. 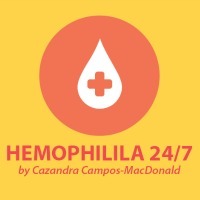 I have heard stories of big, manly, tattooed men on the brink of tears when a needle approaches.......(To read the rest of this post visit http://www.hemophiliafed.org/news-stories/moms-blog/. Thursday, April 17, 2014 is the day our family has been waiting for and working towards for months. It is the day that our mighty warrior "Christian" receives his first dose of Xolair, a relatively new injectable drug that is used to treat moderate to severe asthma. My son does not have asthma, but has developed an allergy to Factor VIII, the clotting factor his body does not produce. Allergies to Factor VIII are not as common as allergies to Factor IX and this has been the problem. There are not many cases that have been studied and successfully treated. Our hematologists and allergist in New Mexico and Colorado have been working tirelessly to get the drug approved through our insurance and it finally happened. What if he has an allergic reaction to the Xolair? What if after his second dose in May he is still not able to tolerate Factor VII? What if we never try the Xolair and it actually works? I have no idea what is going to happen and I am not going to expect the worse...only the best. My mighty warrior, Christian, is doing so well. 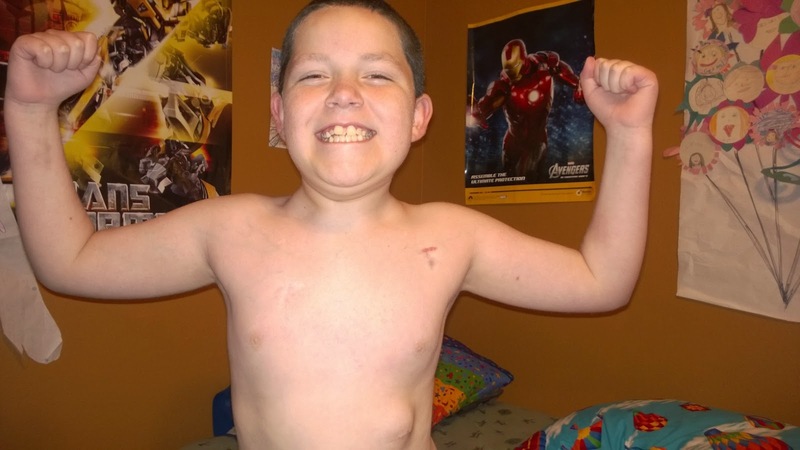 He's been to school 30 days in a row and has not had any bleeds that have kept him down. He has endured a couple of bleeds that we were able to control at home. This has been a huge victory. But there is one thing that he continues to struggle with and it is a product of the Post-Traumatic Stress Disorder that has developed over time. He has a huge fear of needles and accessing is extremely difficult. Sometimes he does well and breathes and focuses but other times he is so fixated on the needle that he completely freaks out. And getting accessed to infuse is critical so we have to hold him down and that is not the easiest thing to do. The other night was not a good night. My husband is the one who is sticking because he is best at hitting the "moving target" and my older son and I have a certain way of holding Christian so that he doesn't hurt himself or anyone else. He is screaming, bucking off the table, tears rolling, his skin breaks out into hives and he is red as a beet. And what are we doing? Remaining calm and making the access happen. None of us misses a beat and then continue on with our night. There is no crying from my husband or myself, there is no "I need to calm down"….we have just become numb to the whole process. I often catch myself thinking about what just took place and it amazes me that it is just part of what is "normal" in our home. When you are in the middle of a crisis, or even a daily routine that seems like a crisis, how you handle the situation is how your children will develop their sense of acceptance of their bleeding disorder. They feel our anxiety and fear and sometimes we are able to keep those feelings at a distance...other times we are not so fortunate. Christian is going to therapy and whether or not it will make a difference is yet to be seen. I just hope with every ounce of my being that this struggle begins to get easier for him. You do what you have to do even if it's not pretty. I am not a fan of rollercoasters. 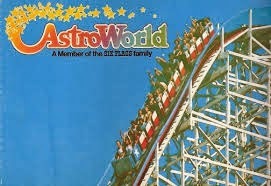 I can still hear the click of the track as the Texas Cyclone crept up the hill. The feeling you get when you go straight down is not something I care to ever experience again. So you will never see me in line at the Tower of Terror :) Going fast is fine but ups and downs are definitely not my favorites. The past year has been that way….filled with ups and downs. My "Christian" has been through so much...our entire family has. His needle fear has been debilitating and we have finally been making some progress in helping him conquer his fears. But tonight was bad. He completely freaked out and it took all three of us to get him accessed. The frustrating part is that he had a super day at therapy and physical therapy and we even received the news that the Xolair has been approved after battling with the insurance for over two months! We end the day on a downer but I know how important it is to keep hope alive throughout our journey. Even when the day ends yucky it doesn't mean tomorrow will be. 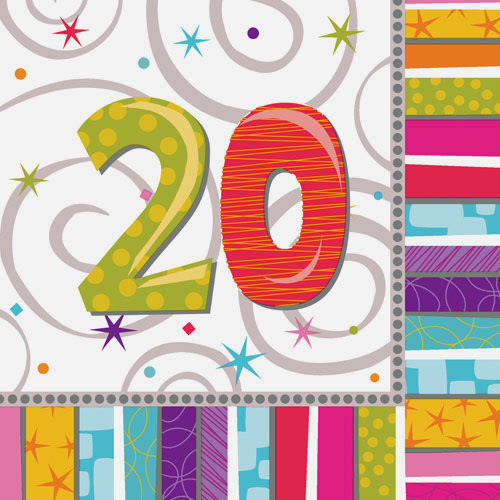 I never dreamed we would make 20 days of school in a row. But there is something else that is absolutely amazing. "Christian" has been struggling with his fear of needles for quite some time. It was to the point where my husband and I had to take him in to the HTC once a week to be accessed because he was fighting so violently. It was a physical and emotional nightmare for all of us. It is to the point where my son has been diagnosed with Post Traumatic Stress Disorder. My sweet boy has been working with a play therapist and a physical therapist (swimming pool) and in order for him to get the full advantage of the pool he needs to be de-accessed and accessed more frequently during the week. I think it has been the motivation he has needed to really start working through his fear. He absolutely loves being in the water. So far we have had three infusions where he has been still and not needed to be held down! Yes, another thing I didn't dream would ever happen. Most people have a crisis for a short amount of time and things move on. When you are in the middle of a "season" of crisis living with a chronic condition it's hard to see the other side. "Will it ever get better? Will we ever move forward?" Yes, it will. It may not always be the outcome you want, but times will get better. Those times may only be moments, but you hold on to what you can. You have to hold on to hope like your life depends on it. Sometimes it's all you have. 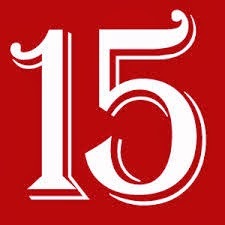 Fifteen days of school in a row! Well, of course that was almost too much to believe. Friday night, as we entered the auditorium to watch my oldest son perform the lead role in "Shrek", my "Christian's" knee started up. I immediately took him home (with my husband recording the show....at least I did see him perform Thursday night and Saturday night) and started aggressively treating. This is definitely a big one for us. It seems as if over the past year whenever a bleed starts in Christian's knee we end up in the hospital for pain management. And when infusing less than Q4 is needed we normally go in for help. We know when to raise the white flag and the doctor's are great about encouraging us to do what is best. As of now we will be getting him off to school tomorrow and hopefully complete day 16. I'll take the little things as they come. Yesterday was by far the best afternoon I have had in months. I had a productive day at work...that is always a positive. But the best part of Friday afternoon was that my "Christian" completed 10 days of school in a row! 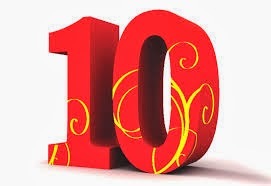 10 Days!! The most he had gone in a row before a bleed took over had been 6. I don't think he has completed 10 days in a row this entire school year. Christian held still while my husband accessed his port. That is HUGE! My sweet boy suffers from PTSD and accessing his port has been a nightmare for a couple of years. Now that he is going to pool therapy for his knee we are having to de access more frequently and yesterday was a great day. I would say that I shouldn't write about our good fortune because I am going to "jinx" our luck. But I am a woman of faith and I don't believe in luck. No, Christian is not walking yet and his knee is a mess. He is allergic to Factor VIII and we cannot get the Xolair approved (yet). There are stumbling blocks and who knows what else in the way as we deal with his inhibitor but what I do know is that I have to hold on to hope. 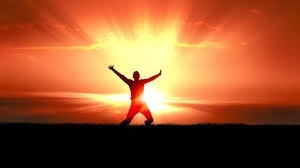 If you are out there struggling with a bleeding disorder or chronic condition, I know that there are times when you absolutely cannot breathe, but hang on tight and hold on to hope, because there is a light at the end of the tunnel. "If I don't talk about it surely it will go away!" "If I don't answer the phone I won't hear the bad news on the other end." 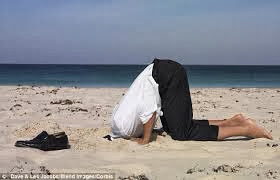 I admit that I like to put my head in the sand. It's easier to let someone else figure out the problem. Well, the days of living with my head in the sand are over. I used to think I had good insurance. I've never had insurance worries like so many other people with bleeding disorders. And when it came to advocacy (like going to D.C. advocacy) I never had a level of comfort with this kind of work. Yes, I admit, my head has been in the sand. And now it can't be. I thought I was about to have a heart attack last week during one of my numerous phone calls to my insurance company. I have been trying for weeks to get approvals for Xolair (an allergy injection) for my "Christian." The allergist we are working with thinks using this drug may help my son with his allergy to factor eight. The insurance keeps denying the drug despite conversations with our hematologist. Their reasoning is "Xolair is not an indicated drug for hemophilia." And the part that absolutely blows me away is that the drug is approximately $800. $800 in the care of son is pennies in comparision to the millions of dollars we use in factor replacement! Yes, millions and he is eight years old. They don't stop to think that this $800 drug may help my son's body accept factor eight and use less factor in the long run. The insurance had the nerve to ask, "Have you paid for it out of pocket to see if it works?" At that moment it felt like one of the veins in my head exploded. I have to get out of my box and do what so many others have been doing for years...get out and educate others and make change happen, in a different way. 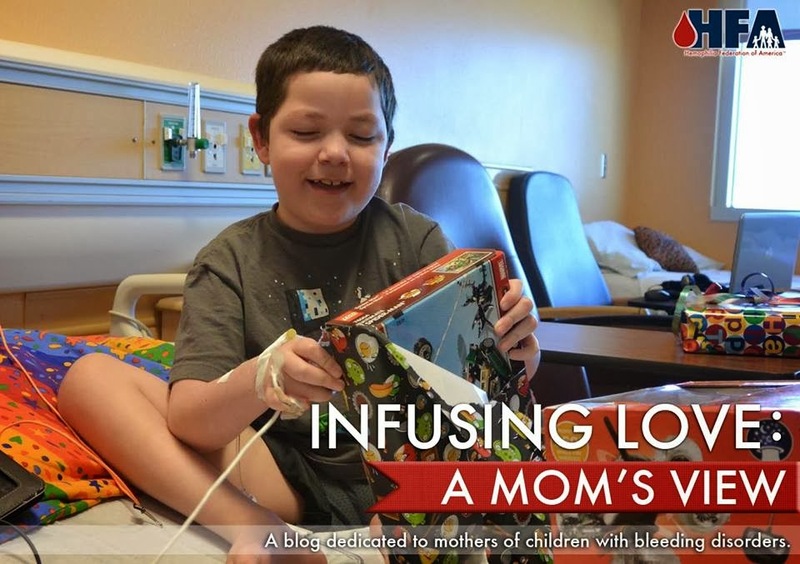 I am only a mom with two sons that have hemophilia. Only. Yeah, right. I should know better than to say that . I am not going anywhere and I will do whatever it takes to make sure that my children get the treatment they need to live empowered, fulfilled lives. No more sand for me. My mighty warrior "Christian" is amazing. He manages to be happy despite not being able to walk, despite missing so many days of school and even despite spending day after day in the hospital because of his bad knee. His right knee started becoming a problem in January 2013 and here we are in the hospital again. Again and again and he's not even walking. It is so frustrating. I sound selfish but the fact is that living with a severe bleeding disorder with an inhibitor is extremely difficult on the entire family. You try to keep a stiff upper lip and manage to tell people "It's okay, he's a tough boy, we are okay, we do what we have to do," etc. etc. But honestly, I am exhausted. Exhausted to the point that I don't know if I want to scream or cry or just crawl under the covers. One of the most trying parts of Christian's condition is that his treatment is being managed by a team out of state and getting that team to talk to our in state team and actively get on the same page is difficult. They work well together, but right now we are running circles and always treating a bleed in a crisis management mode. We need more and I think this hospitalization has opened the eyes of some of the clinicians working with us. Finally. With my oldest son hemophilia was a breeze. I always wondered what the fuss was about. I didn't understand target joints, pain and why some of the younger generation needed wheelchairs and walkers. For everything my "Lance" did not go through Christian is experiencing ten fold. I would love to see him run but walking on both legs without a walker would be amazing. To see him walk up and down the stairs on his own instead of scooting on his bottom from step to step would be a victory. And to watch him walking on his own without the stares a wheelchair brings would make my heart burst with joy and gratitude. I have hope and I'm not giving up. I'm his Mom and I will do anything and everything possible to help him get to a better place! I just have to look into his eyes, snuggle up with him at night and feel his breath on my face to remember that the pain will pass and the moments of joy and happiness we have far outweigh the painful moments of living with hemophilia. My mighty "Christian" has a debilitating fear of needles. Because of this fear and the fact that he needs daily infusions, we access his port once a week and leave it accessed. Due to the physical and emotional stress and trauma accessing causes, my husband and I have recently started to take him in to the HTC once a week to for his access. We had finally raised the white flag and said that we just could not do it anymore at home. Sunday night is our typical accessing time. We had been talking to Christian about working on his breathing so that we might try to access at home instead of going to the HTC this week. He did it!! He laid down, breathed and breathed like crazy and we accessed without holding him down! When my husband said "We are in!" my sweet boy started crying because he was so happy and proud. I have no idea what next Sunday night will bring but what I do know is that we had a huge victory tonight. Hope is a good thing and sometimes, when you least expect it, some great things happen that let you know that everything will be okay. Having a good attitude and tons of hope to start the New Year is a good thing. And then it happens…. "Mom, my knee hurts." Ugh. On the evening of the 16th I knew that the pain was about to get out of control so I took "Christian" to the hospital where he was admitted. Fortunately he did not have to use a morphine pump but did get numerous doses of morphine IV. I was glad I listened to my instincts and took him in...we seemed to get a little ahead of the bleed. But the yucky part was that he had to spend his 8th birthday in the hospital :( Halloween, Christmas and now his birthday! Really? I was going to make sure we all celebrated regardless of our physical location. You know, it was a pretty great day :) Presents, balloons, singing and cupcakes. Everyone on the floor made sure he felt extra special that day and I am so grateful for the amazing nurses, techs, child life specialists and doctors on the 6th floor at the University of New Mexico Children's Hospital. They are pretty amazing. Celebrations need to happen. Hospital or no hospital. Bleed or no bleed. Keeping life as normal as possible is a necessity. Life keeps moving and I am going to make sure my son does not miss out and that he knows he is loved.